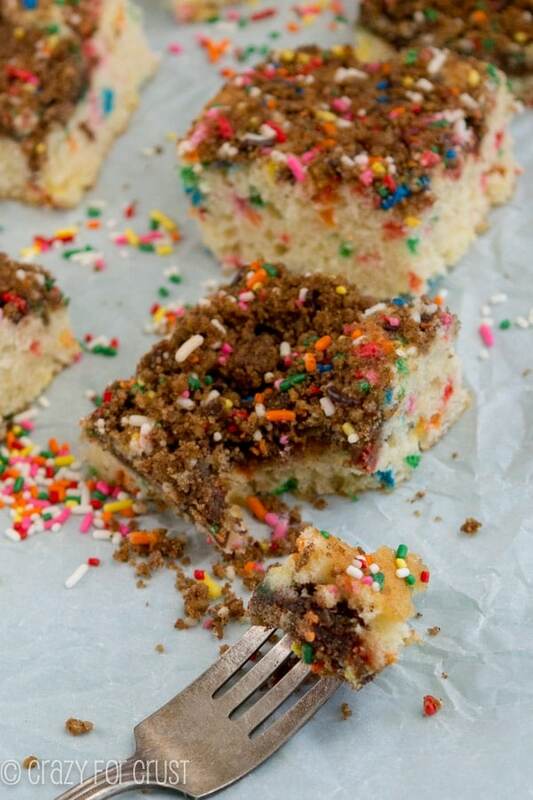 Funfetti Coffee Cake – I think I’m making it my mission in life to add funfetti to pretty much everything. When I was a kid I haaaaated antique stores. My parents would bribe me with a Blizzard to only complain marginally as we stopped at every single antique shop between San Francisco and Seattle. As a kid, my mom (and dad) always said: “Your tastes will change.” They meant it about food…and life too. I always scoffed and rolled my eyes. Now when I see an antique store, I run as fast as I can…inside. I could spend hours looking through every nook and cranny for props for all these photos I take on the blog. Plates, linens, cups, cake stands, silverware…the list is endless. The fork in these photos is one of the ones I bought. It’s actually different than the one I’ve used in approximately 1,234 other photos! I should have believed my mom when she said I’d like antique stores one day. Mom is always right, after all. And since Mom is always right, you’ll know this Funfetti Coffee Cake is perfect…because it’s based on her recipe! 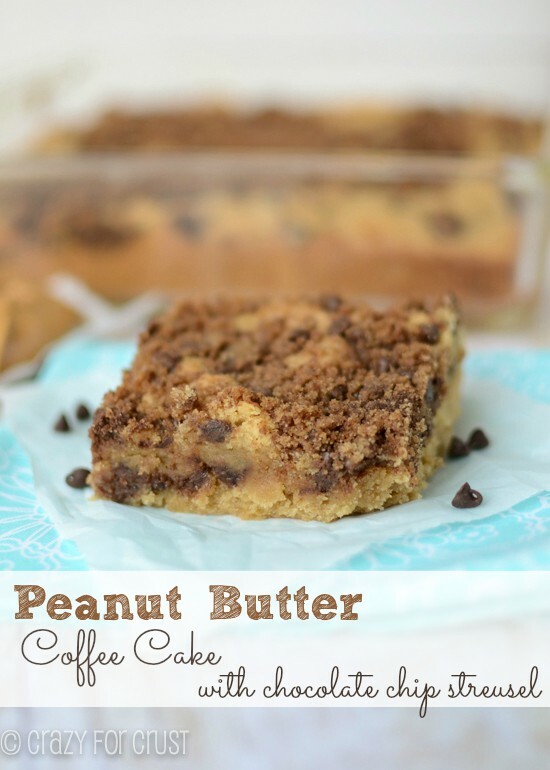 I’ve made lots of coffee cake here on the blog, and all of them are adapted from my mom’s base recipe. This Funfetti Coffee Cake is the closest I’ve come to her original recipe . This Funfetti Coffee Cake recipe just has a few changes to make it into my favorite flavor: funfetti. There’s just something about funfetti. I Can’t. Get. Enough! I think it’s the sprinkles. They make my heart go pitter-pat. 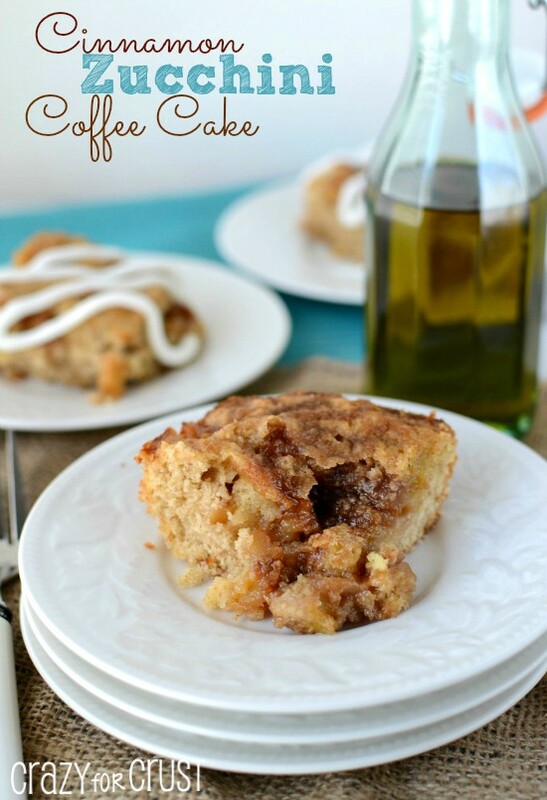 The coffee cake is made with melted butter, so you can just stir it. No mixer needed; in fact, it’s best done by hand. There’s too much of a tendency to overmix when using a mixer and you want this cake to be light and fluffy and just mixed, so by hand is perfect. To make the Funfetti Coffee Cake taste like a funfetti cake, I added vanilla extract and butter extract to the batter. Butter extract gives that rich buttery cake-mix flavor, without using cake mix. The top of this Funfetti Coffee Cake is covered in a rich buttery and brown sugary cinnamon streusel. 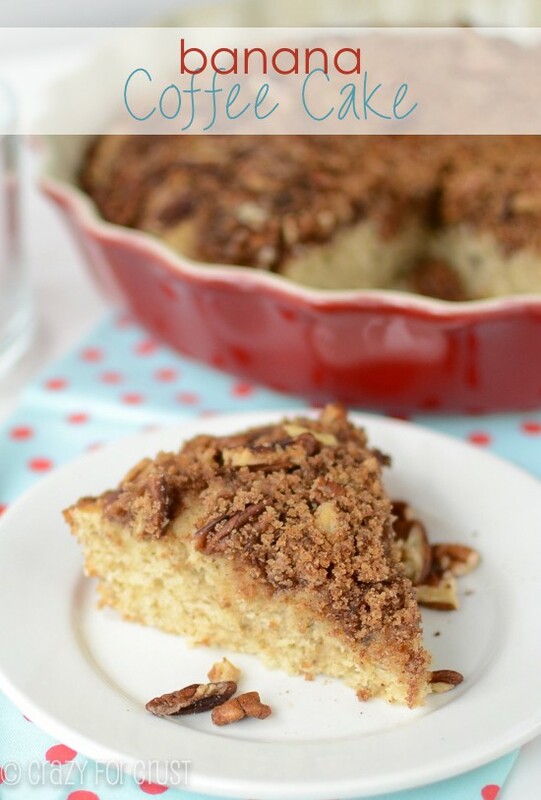 Really, the streusel makes the coffee cake, am I right? It’s my favorite part, for sure. And then there’s the sprinkles. 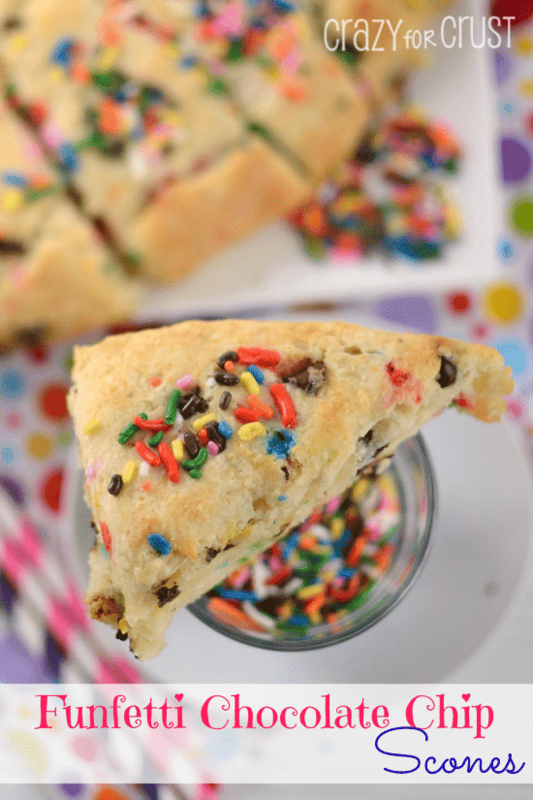 It wouldn’t be funfetti without sprinkles! I filled the cake and the streusel with rainbow sprinkles (I call them jimmies). I don’t recommend using nonpareils, as they may dissolve. Regular rainbow sprinkles (like the Cake Mate and Wilton brands) perform the best in baking, for me. I like buying the tubs of the Cake Mate jimmies at Walmart. I will never ever get enough sprinkles. Or funfetti. 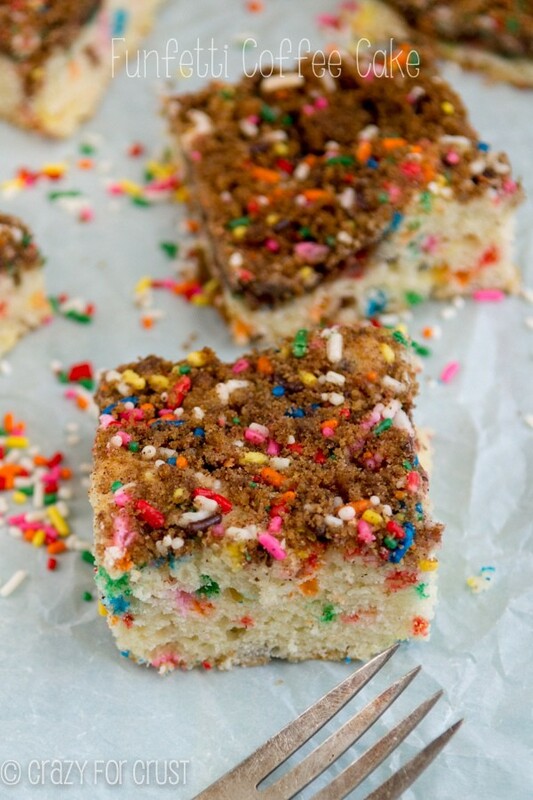 My mom's favorite coffee cake - that tastes like birthday cake with sprinkles! Preheat oven to 375°F. Spray a 9x9 square pan with cooking spray (the kind with flour in it). Whisk flour, baking powder, and salt in a small bowl. Set aside. Stir melted butter and sugar. Mixture will be grainy. Stir in egg and extracts. Stir in milk, then stir in dry ingredients until just mixed. Stir in sprinkles. Make the streusel: Stir melted butter, flour, brown sugar, cinnamon and sprinkles in a small bowl. Sprinkle over cake. Bake for 23-30 minutes, until a toothpick comes out clean. It cuts best when completely cooled, but you can serve it warm. Store in an airtight container for up to 3 days. Cooled cake can be sliced and placed in an airtight container and frozen for up to 1 month. Anytime you can put sprinkles on breakfast food seems like a win to me! My mom loved antique stores too! She collected a particular brand of dishes called Luray, and they discontinued it a loooong time ago. The dishes are all pastel colors (blue, green, yellow, and pink), and she has a huge collection that we pull out for fancy holiday dinners. I wish we had more antique stores near Davis; as far as I know, we just have one or two tiny thrift stores. Not the same! 😉 I’m all for adding funfetti to everything. It makes everything so cute and cheerful! and I’m never gonna complain about more coffee cake or more funfetti! It’s just…so…FUN! Yay for antique stores and love the fork you found for a great steal! I dream about the streusel on coffee cakes but add funfetti into the mix? That’s my fantasy come true 🙂 Pinning!